A poison is any potentially harmful substance taken into, or applied to the body. Exposure can occur by ingestion, inhalation, injection, and through the skin or eye. Almost any substance may be poisonous if you come into contact with excessive quantities. You should ALWAYS consult your physician or the Poison Center to determine if vomiting is necessary and/or safe. Home remedies SHOULD NEVER BE USED for making your child vomit, including syrup of ipecac, mustard, salt water, or sticking your finger or other objects in the child’s throat. 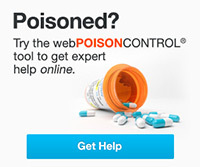 If you suspect you or someone else has been poisoned, call the Poison Center at 1-800-222-1222. The Poison Help number will work anywhere in the United States and Poison Center specialists are trained to assess and make decisions on the best care for your situation. Who are the Poison Center’s most frequent callers? Our most frequent callers are mothers or daycare providers taking care of children under the age of 5 years old. The busiest time for the Poison Center is during the summer months since children play both inside and outside the house and more things available for them to get into. The busiest time of the day for the Poison Center is in the evenings between dinner and bedtime. The most common exposures are medications that resemble candy or flavored drinks since they may not only look good, but may also be made to taste good. Commonly, young children will drink cough and cold syrups, asthma syrups, liquid acetaminophen or Tylenol, and liquid antibiotics. The Minnesota Poison Control System does not take calls related to animal poisonings. Please contact your veterinarian or call any of the resources listed below. A fee may be associated with calling these numbers. For more information, visit the Animal Poison Control Center.